Wiccan tattoo ideas could prove the most difficult because Wicca is a religion that is connected to the power of the earth, with many symbols and facets that represent it. There are many misconceptions about what Wicca is and what it's not. Many feel that Wiccans worship the Devil or other demonic entity, but this is not at all the case. The Wiccan belief is centered on one common belief: "Harm none lest ye be harmed thrice". This Wiccan rede merely states that you should not harm another person or it will be brought back to you three times over. Wiccans take great pride in the world around them and use it as a basis for many of their symbols. The belief has in it a God and Goddess which represents different things but neither can exist without the other. 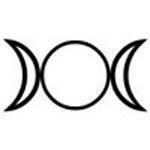 The Goddess represents the night, moon and the earth whereas the God represents the sky and the sun. The religion of Wicca is full of symbols and meanings that are ancient in their nature. Unlike other religious tattoos the tattoos you can find with Wiccan themes are more diverse and subtle. The most common symbols are listed below. 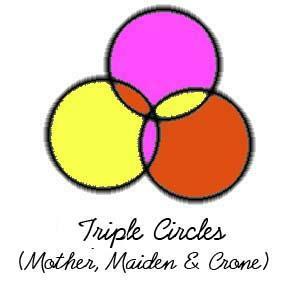 These symbols are easily noticed and understood by many people. 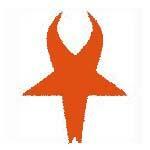 Many people involved with mainstream religions often view this symbol as being evil. This couldn't be furthest from the truth. The pentagram is the symbol of severity, conflict and resolution as well as representing life. The symbol is very reminiscent of the Vesuvian Man as painted by Leonardo da Vinci. The number 5 has great meaning in life as humans have 5 fingers and toes, Christ had 5 wounds on the cross, we have 5 senses, etc. For Wicca, each point represents an element: spirit, air, fire, water and earth. As far as Wiccan tattoo ideas go, the pentagram tends to be the most widely used of the possible designs. There are three main styles of the pentagram with each having their own meaning. 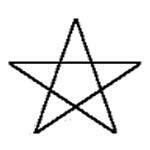 Open Pentagram: This is the symbol without a circle surrounding the 5-pointed star. This means that you are outgoing, open and ready to accept conflict. Closed Pentagram: This pentagram is encased by a circle and represents protection. It also represents eternity, infinity and the circle of life. Inverted Pentagram: This pentagram is often associated with the darkness in nature; the evil within us all. The inverted pentagram is actually a symbol of confrontation of self; to know and understand the darkness within in order to control it. There are other variances that you can do with your pentagram tattoo by including such things as runes, the Green Man, the Goddess or the Horned God. You can also make your pentagram out of leaves or twigs and even colorize the points. 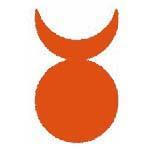 This symbol is one of the most mysterious as there is no cut and dry dating of it. 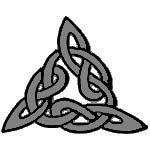 The symbol has been found in Celtic and Norse stonework. Wiccans often view the Green Man as a deity of the Earth and representing growth. The figure is often seen made out of foliage and brush. 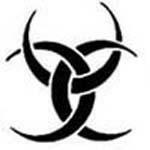 If you are a practicing Christian you will most likely recognize this symbol in regards to the holy trinity of the father, the son and the Holy Ghost. The symbol, however, predates Christianity and finds its mark with the ancient Celts. 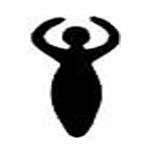 Though thought of as a goddess symbol it is more likely a symbol to represent the three divisions of the animal kingdom or the three domains of Earth. The symbol can be closed or open as the pentagram can be.